When the calendar event control has more data than it can hold, the "down arrow" icon shows up at the bottom of the control. 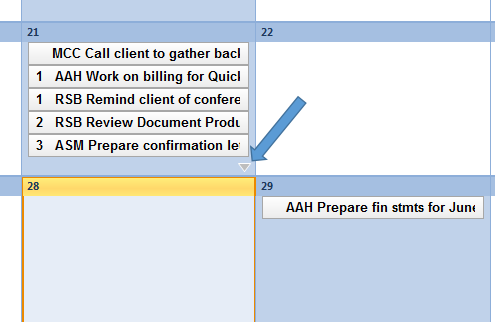 The default behavior of clicking the arrow is to open up the daily/day view of the calendar. We are trying to open up a popup window on the click of the arrow icon instead of opening the daily view. We were not able to find the event that triggers this click in the code. Please find attached a screenshot of the control below. This is something we need to fix ASAP and would appreciate it if your team could share some tips/code samples to resolve this issue.